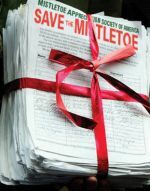 Smirnoff Ice's Save the Mistletoe is an amusingly long-way-around attempt to say Smirnoff brings people together (just like mistletoe - so stop ravaging innocent bushes). While we remain unmoved by the plight of the sprig, the execution wins us over. By some curious witch magic the campaign features celebrity supporters that we thought were long dead or had found joy in covert day jobs. Natalie from The Facts of Life, Lisa Turtle from Saved by the Bell, Tiffany who crooned "I Think We're Alone Now" and even the Soup Nazi band together to protect the kissing plant from further appropriation by brute force. That's not all. Kevin at PR Blog divulges having seen a swamp-like creature that was actually supposed to be mistletoe, getting heckled by children at a nearby ice rink for love of the campaign. We wonder which sponsoring celebrity burn-out he happened to be. We put our money on The Incredible Hulk.